Hello eP friends!! It's Starla here again, sharing my second project that I've made as this month's guest DT. What started out as one idea, turned into another. And so, I present my version of a Canvas Message Board. I began with an 8x8" stretched burlap canvas . I randomly applied TenSecond Studio's Ver-Day paint in Bronze and Iron on the canvas and sprayed with the Verday patina spray. While the patina was working it's magic, I began to work on my canvas embellishments. I pulled out Wendy Vecchi's Clearly for Art Whiteout modeling film. Sigh. I just have to say, I REALLY wish this stuff came in rolls!! Hello, Wendy? Are you listening?!! It is SO much fun to work with!! **Warning: blasting your heat gun while trying to hold and mold your piece can lead to singed fingers. I would recommend use of crafting tweezers to help assist. Unless you are uncoordinated (cough, cough....like someone who will remain nameless) in the fine motor skills it takes to hold the heat gun, tweezers and shape. In that case, make sure that no young children are in the vicinity as inappropriate words may be uttered in the name of Art. ANYHOOS!! 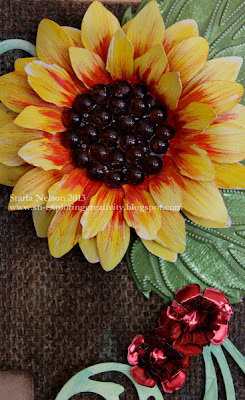 Using a retired sunflower die from Spellbinder's, I cut two sunflower layers. Note that the thin Spellbinder's dies do NOT all the way through the modeling film, despite running it through my machine multiple times and turning the piece 90° after a couple of passes. But, the thin dies will cut through the film enough that taking snips and finishing the job is not a huge deal. 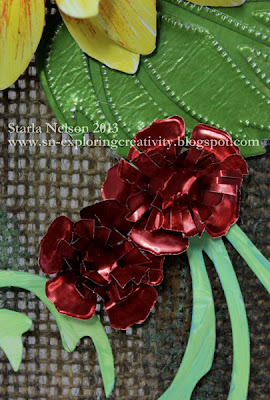 I also cut two layers of the second largest flower from Tim Holtz's Tattered Florals Die. By the way, the large Sizzix dies cut the film easily! 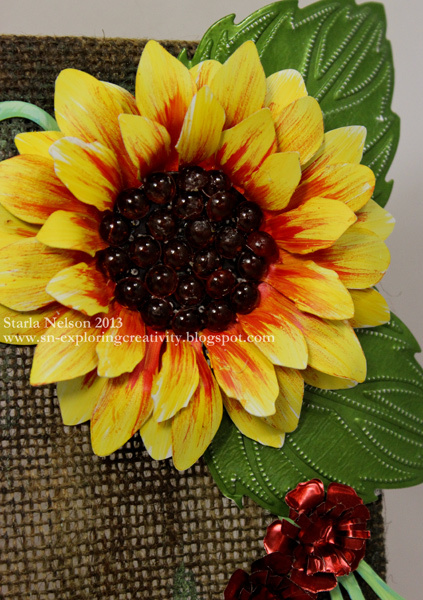 After cutting my flower layers, I painted the petals with Claudine Hellmuth's paints. I didn't worry about perfect coverage of the petals as any white would give the impression of light hitting the petals. The different layers were then heated and shaped with a heat gun. All the layers were then adhered together with a hot glue gun. I cut the petals off the tattered floral flowers and glued them at the base of the larger flowers to add the center layer. A piece of chocolate brown metal from TenSecond Studios was cut and embossed with the sunflower center die and adhered in the center. I then pulled out my forgotten dew drops and used some Glass, Metal and More glue from Beacon to adhere them in the center. I then die cut the sunflower leaves from some Appletini Metal (also from TenSecond Studios). Keeping the metal in the die, I placed the metal on a thin mat, with the back side of the metal facing up. Using a decorative wheel, I traced along the edges to add some texture. The small red flowers were die cut from TenSecond Studios Barn Red metal using the Tattered Florals smallest die. I cut two layers for each flower, snipping the second one into "shreds" to make the center. The swirls are another Alteration Die , Elegant Flourishes, that were cut from Clearly for Art Whiteout and painted again with Claudine's paints. 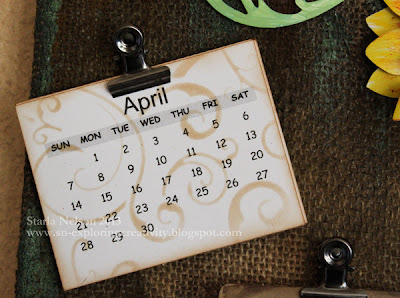 The mini calendar template was found on Splitcoaststampers. 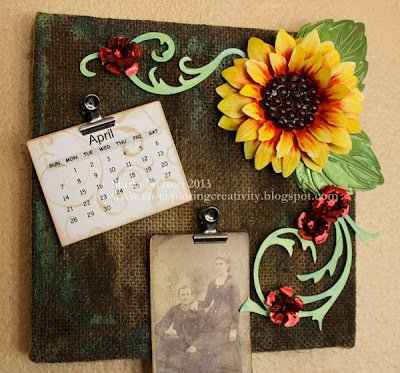 I then lightly sponged Distress Vintage Photo ink through a TCW stencil over the calendar and along the edges to add a little pizzazz. 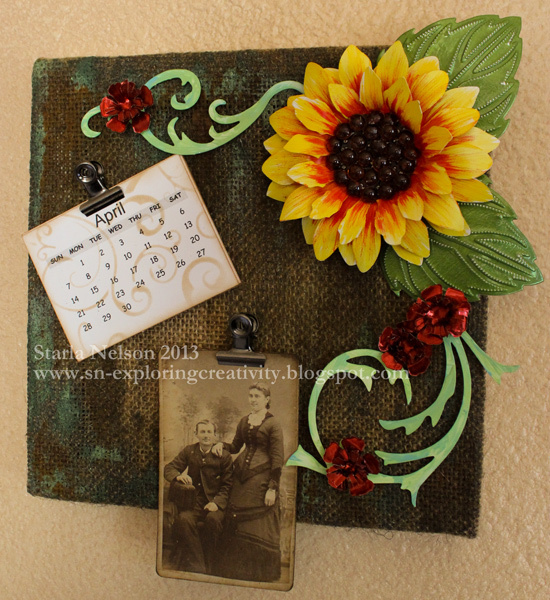 The calendar and the vintage photo (which is actually a photo tin) were adhered using some Idea-ology mini clips. I used fasteners (brads) to attach the clips to the canvas. This way, I can rearrange the clips to a different area if I want to change out what is being held. I've considered adding hooks on the bottom of the canvas to hang keys from also! Thanks for allowing me to share some creativity again this week!! Looking forward to next week! Wow..stunning board Starla...the sunflowers are beautiful and the centre..scrummy!!! Your project has brightened my grey day here in Scotland. Great message board. That sunflower is perfection! Love the center. Wow, that sunflower is amazing, Starla! Great project!! Oh wow! Your project is gorgeous! I LOVE how you created the sunflower and leaf! I will definitely have to try the leaf technique that you used! WOW this is amazing- your flowers are so gorgeous!! LOVE it! This is such a cool message board. I love the bright and cheerful flowers. They are gorgeous. The leaves are amazing with the extra texture. How cool that the photo and calendar page can be changed out. Great use of the clips for that. What a fabulous make - I love the vivid florals against that gorgeous vintage background! gorgeous project! I love the coloring on the burlap and your leaves are fabulous. Thanks for sharing! This is just fabulous, Starla! I always love your metal work!!! Starla this is gorgeous and I am so tickled that you showed us how to make your pretty sunflower! !